This gown, after Jupiter’s Wedding gown, was yet another gown which I instantly knew I had to reproduce the moment I saw it. 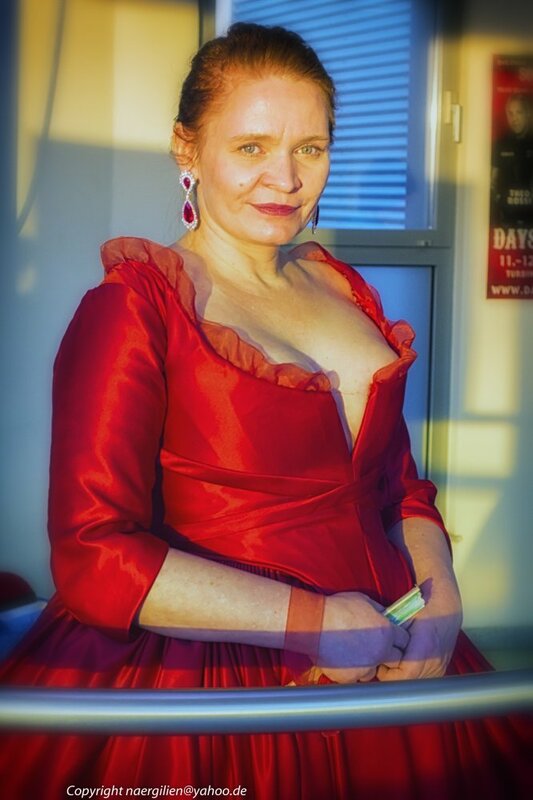 The style is a modernized version of a Rococo court gown – worn with a court pannier; but the length is too short for a court gown and, of course, that neckline / cleavage isn’t historically accurate either. 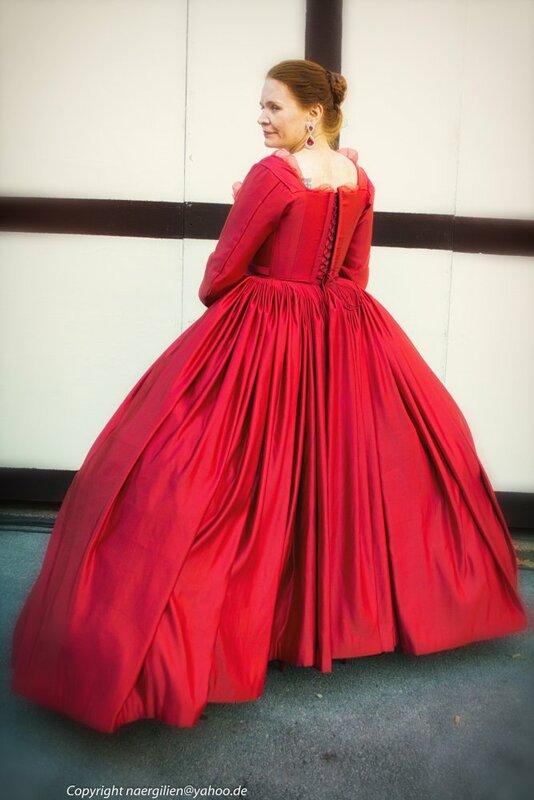 But still, it’s a very pretty gown. I started by creating a court pannier. 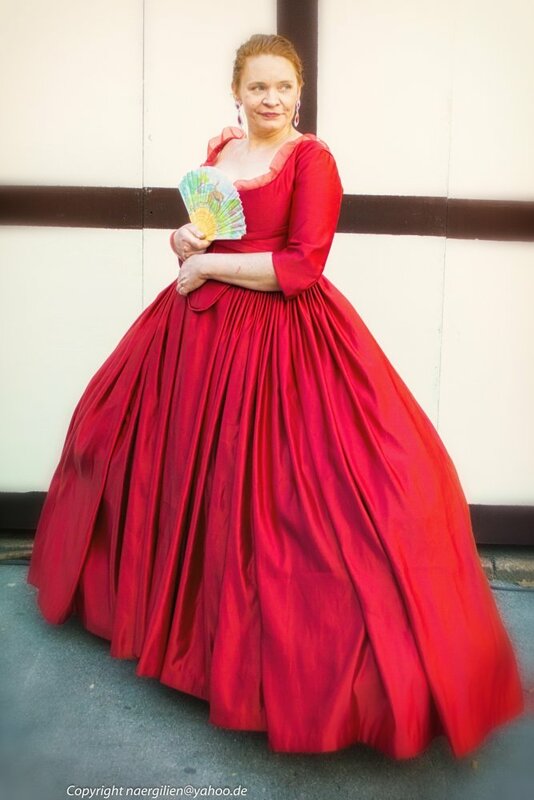 To do so, I used a pattern of a pannier shown in Corset and Crinolines By Norah Waugh. I slightly modified it to match the size on the gown; and also added more hoops – the bottom hoop, which is also doubled – so the pannier can actually “carry” the enormous amount of fabric (12 yards!) in that skirt. 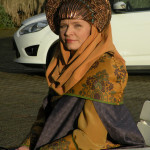 I used ivory polyester Duchesse satin as a fabric. 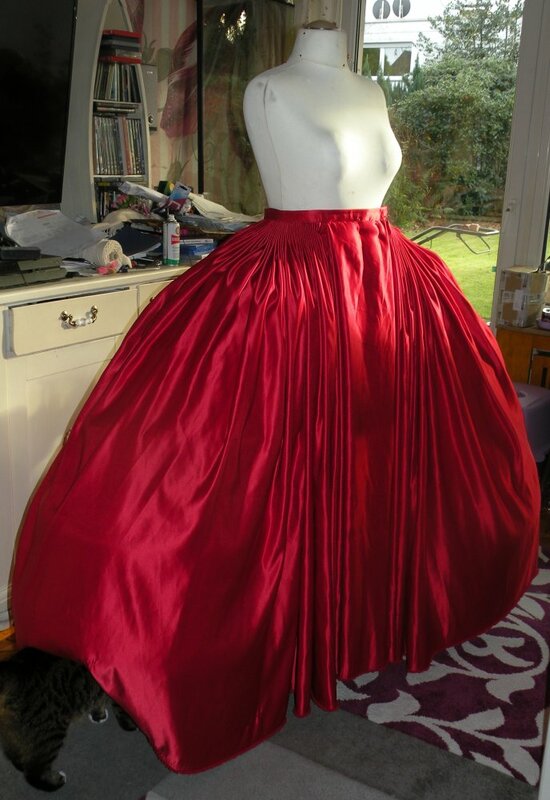 I then draped the full amount of fabric over that pannier (yes, I actually created the skirt from a full length of fabric, not by sewing several panels together! ), pinned at the waistline, then cut away the excess fabric at the top. 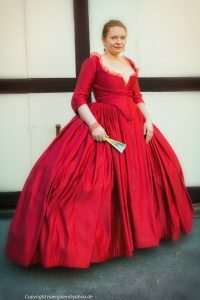 Because, you know, during the Rococo period they didn’t trim excess fabric at the bottom, but at the top of the skirt. 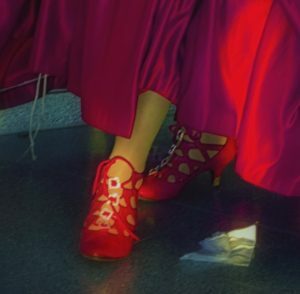 So the hem above the ground is always on the straight grain, while the part that attaches to the waistband is often not on the straight grain (because of the curve that is necessary to accommodate the fact that the sides of the skirt need to be longer than front and back because the pannier is so very wide). 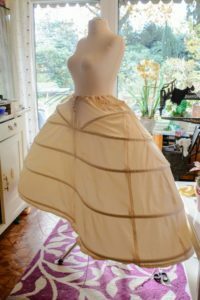 The original skirt had approximately 220 pleats, as I could count from exhibit photos of the original gown. 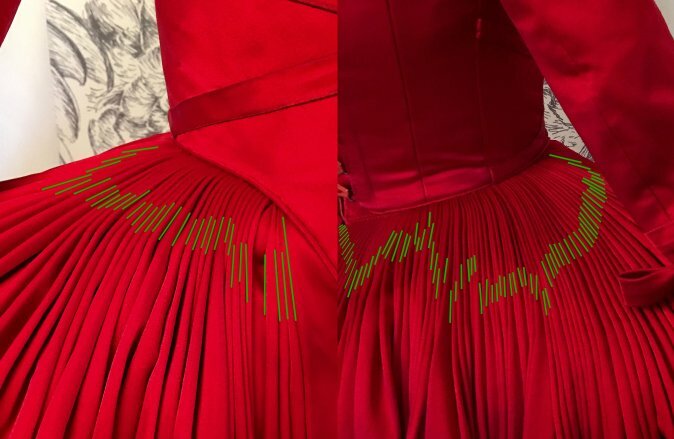 Digitally counting the pleats on the original gown by marking each pleat on front- and back photos of the gown with a small line in Inkscape, then selecting all the green lines and let Inkscape do the object count. That’s 110 green lines for each side of the gown; resulting in a total of 220 pleats for the entire skirt. 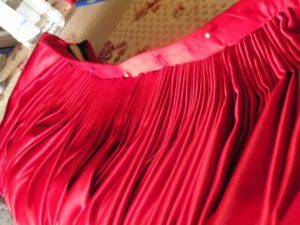 So I gathered the top portion of my skirt fabric into regular pleats and sewed those one by one to the waistband of the skirt. Each pleat is 1” deep (1 inch “up”, one inch “down” for each pleat); there are approximately 220 pleats on my skirt; just like on the original gown. I first gathered, then pinned, then sewed every single pleat to the waistband with a single stitch using nylon thread. 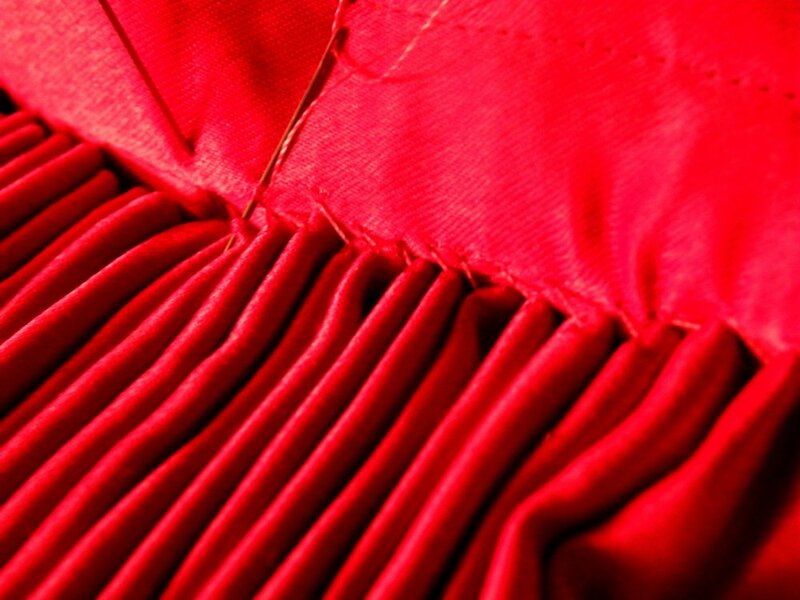 The edge of the folded, pinned pleats is reinforced with a strip of stiff crinoline fabric, so the pleats can actually “stand” the way they do instead of collapsing (which they would with the very soft polyester Duchesse satin I used for the gown). 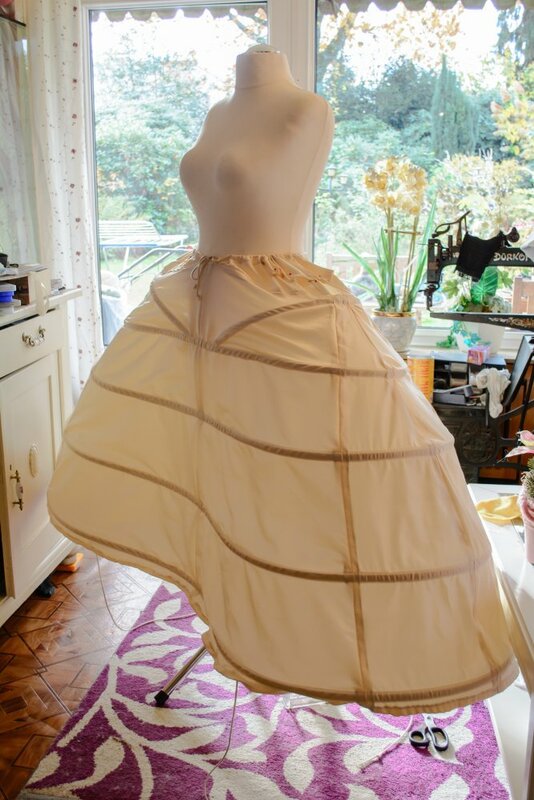 First testing of the skirt over the pannier on the mannequin. Of course, I also created a bodice. 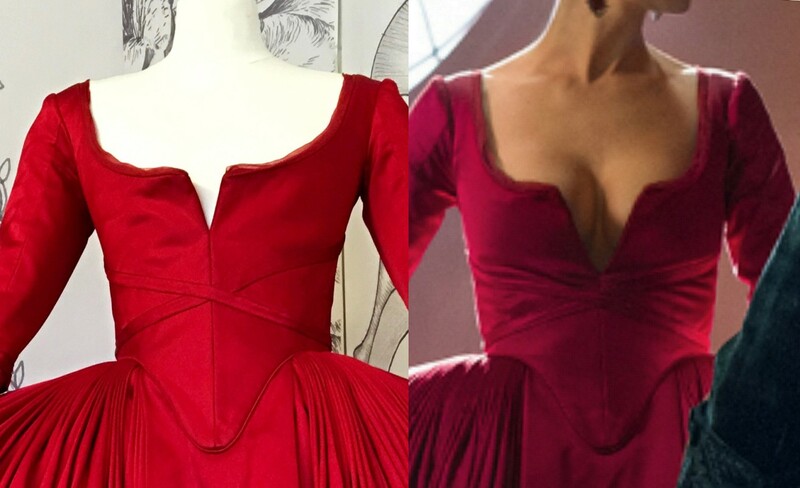 Note that in Dresbach’s Atelier, the V-shaped opening at the center front is much less deep than it is in the TV series; indicating that said V-shaped opening was enlarged after the gown was created and before filming started. 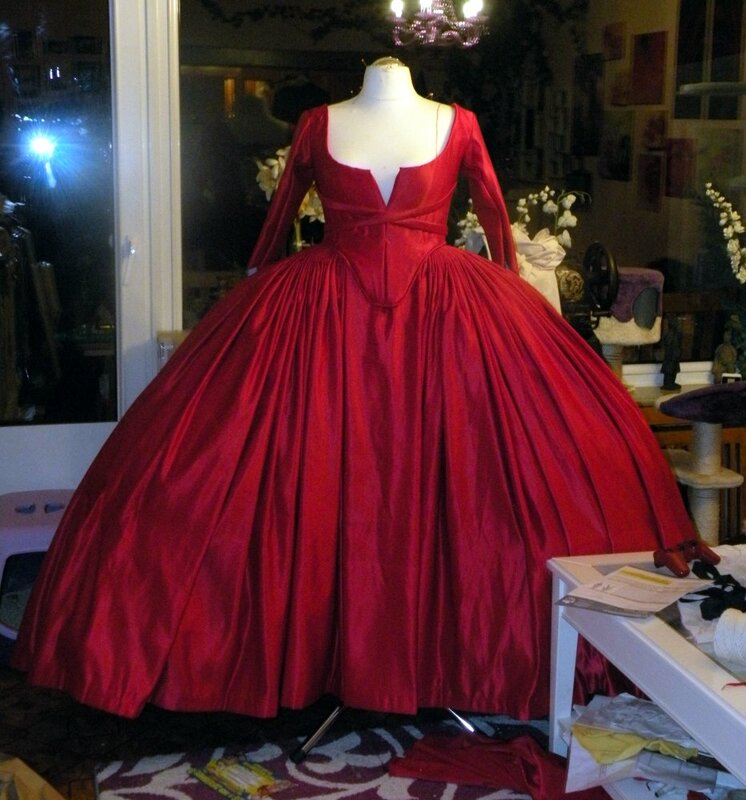 My almost finished gown with the bodice on the mannequin. That was the night before Comic-Con, so I didn’t have much more time to add the bows on the sleeves and the organza on the neckline. 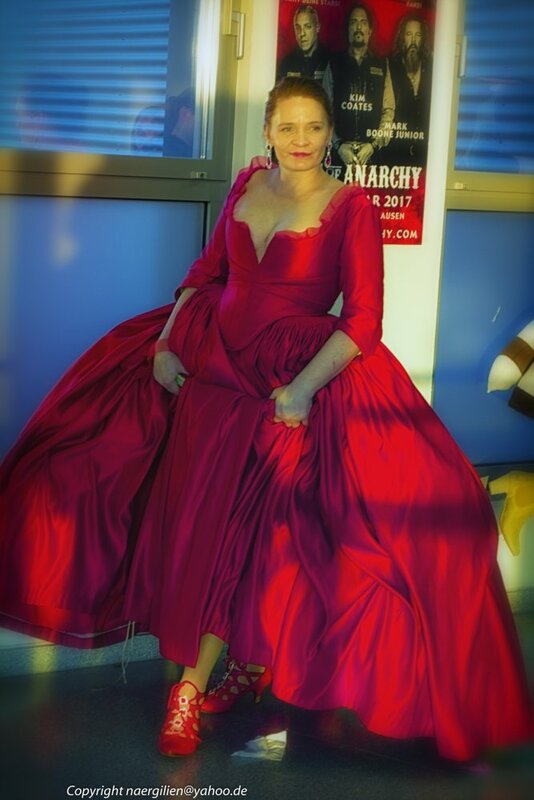 Me wearing my finished gown at Comic Con Dortmund in December 2016. The shoes were ready-made black shoes, which I painted and added rhinestone buckles to. The organza along the neckline was a last-minute addition, which turned out bad – it’s ruffled instead of being straight. Maybe one day I’ll have the opportunity to change it. I also hand-painted the fan (with crayons because I didn’t have proper acrylic paints at home).